¿Quieres más alicientes para no perderte la presentación del dia 7? 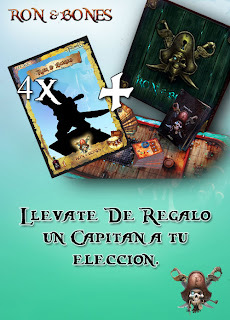 Si nos presentas una prueba de que tienes en tu poder una copia del juego Ron&Bones y 4 de sus piratas adicionales, llévate de regalo un capitán pirata a tu elección!! Sigue atento a este blog, cada dia más novedades!!! i'm a french player of your game so i want to know if the captain will be available for buyers of your game who can't come at your presentation. I specify that i have bought all your products including of course the rules (in ludikbazar website). So how can i get this figure ? I'm in doubt about this offer : is the captain an exclusive figurine or a pirate amongst the pirates already available ? On March 7 in the presentation we will do many activities for the players who represent. This day we will present the next bunch of new releases. One of them the been afraid Captain Matusalen the damned one. We will do a few special offers to the players who are present at the presentation. But the miniatures will be totally available for the sale in your habitual shop few days later;).